For Maharashtra recording a marginal improvement as compared to last year’s performance, close to 100 candidates from Maharashtra figured in the final merit list announced on Tuesday by the Union Public Service Commission. The questions are of multiple choices, objective type. Indian Polity and Governance – Constitution, Political System, Panchayat Raj, Public Policy,Rights Issues, etc. Economic and Social Development Sustainable Development, Poverty, Inclusion, Demographics,Social Sector initiatives, etc. 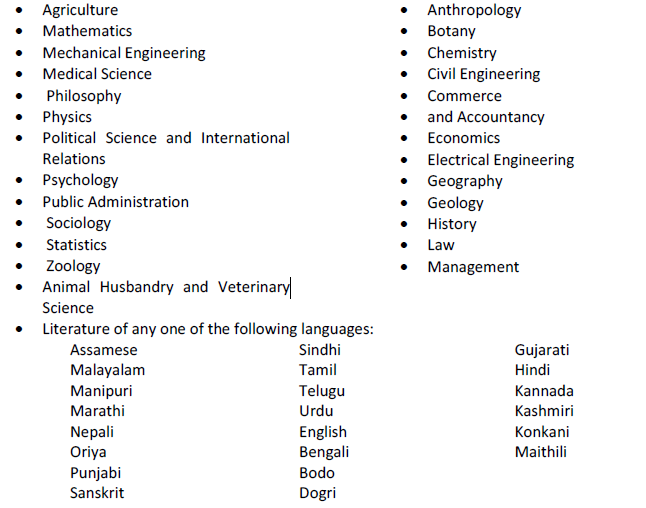 The question papers are set both in Hindi and English. Note: From 2014 prelims CSAT paper is of Qualifying nature where student need to get minimum 33% i.e. 66 Marks out of 200 Marks. These marks will not be counted in Prelims result. Apart from this there will be papers on regional language (Paper A) and English (Paper B), 300 marks each. But these will be only of qualifying nature. There marks will not be counted in final analysis but the papers on Essay, General Studies and Optional Subject of only such candidates will be taken cognizance who attain 25% marks in Indian Language and 25% marks in English as minimum qualifying standards in these qualifying papers. Marks obtained by the candidates for all papers mentioned in above table will be counted for merit ranking. However, the Commission will have the discretion to fix qualifying marks in any or all papers of the examination. 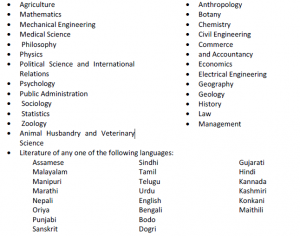 Candidates will have the option to answer all the question papers, except the Qualifying Language papers Paper-A and Paper-B, in any of the languages included in the Eighth Schedule to the Constitution of India or in English. Candidates exercising the option to answer Papers in any one of the languages may give English version within brackets of only the description of the technical terms, if any, in addition to the version in the language opted by them. Candidates should note that if they misuse the above rule, a deduction will be made from the total marks. The mains questions are such as to test a candidate’s general awareness of a variety of subjects, which will have relevance for a career in Civil Services. The questions are likely to test the candidate’s basic understanding of all relevant issues, and ability to analyze, and take a view on conflicting socio- economic goals, objectives and demands. The candidates must give relevant, meaningful and succinct answers. If a candidate’s handwriting is not easily legible, a deduction is made on this account from the total marks otherwise accruing to him. Marks are not allotted for mere superficial knowledge. Credit is given for orderly, effective and exact expression combined with due economy of words in all subjects of the examination. The question papers for the examination are of conventional (essay/descriptive) type. Each paper is of three hours duration. (i) Comprehension of given passages (ii) Precis Writing (iii) Usage and Vocabulary (iv) Short Essays Indian Languages :- (i) Comprehension of given passages (ii) Precis Writing (iii) Usage and Vocabulary (iv) Short Essays (v) Translation from English to the Indian language and vice versa. Candidates may be required to write essays on multiple topics. They are expected to keep closely to the subject of the essay to arrange their ideas in orderly fashion and to write concisely. Credit is given for effective and exact expression. Important aspects of governance, transparency and accountability, e-governance- applications,models, successes, limitations, and potential; citizens charters, transparency & accountability and institutional and other measures. bio-technology and issues relating to intellectual property rights. Conservation, environmental pollution and degradation, environmental impact assessment Disaster and disaster management. society and educational institutions in inculcating values. Aptitude and foundation values for Civil Service , integrity, impartiality and non-partisanship, objectivity, dedication to public service, empathy, tolerance and compassion towards the weaker sections. of ethical and moral values in governance; ethical issues in international relations and funding; corporate governance. Information sharing and transparency in government, Right to Information, Codes of Ethics, Codes of Conduct, Citizen’s Charters, Work culture, Quality of service delivery, Utilization of public funds, challenges of corruption. alertness, critical powers of assimilation, clear and logical exposition, balance of judgment, variety and depth of interest, ability for social cohesion and leadership, intellectual and moral integrity. study but also in the events which are happening around them both within and outside their own state or country as well as in modern currents of thought and in new discoveries which should rouse the curiosity of well educated youth. Union Public Service Commission is an autonomous constitutional body which recruits personnel for different Union Services except Armed Forces. Civil Service is responsible for implementing the laws made by the legislature as well as the policies formulated by the government. This is the higher class among the public administration, which includes domestic as well as foreign affairs. The Union Public Service Commission (UPSC) has released the official notification of the Civil Services preliminary examination. The last date to submit the application form is May 27. The candidates will be selected on the basis of their performance in the preliminary examination followed by the main examination and an interview. Candidates are required to apply Online by using the website http://www.upsconline.nic.in. Application Form” given in Appendix-II. The online Applications can be filled up to 27th May, 2016 till 11:59 PM after which the link will be disabled. The eligible candidates shall be issued an e-Admission Certificate three weeks before the commencement of the examination. The e- Admission Certificate will be made available in the UPSC website [http://www.upsc.gov.in] for downloading by candidates. No Admission Certificate will be sent by post.